Seven decades since the end of World War II, do U.S. women still lead in workforce participation rates? 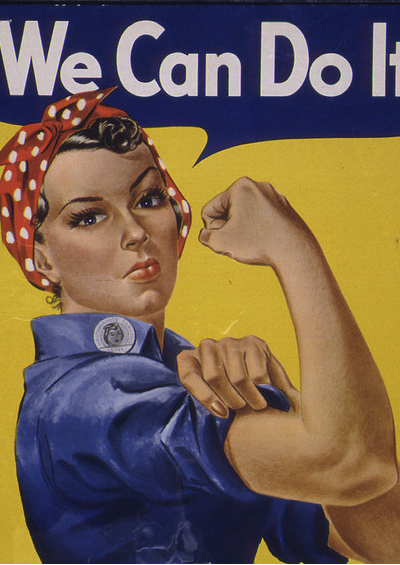 By 1970, the U.S. female labor participation rate had risen above 50% for the first time. In 1999, the U.S. female labor participation rate peaked at 77%. The U.S. female labor force participation rate is five percentage points lower than the 28-country average for the EU. The feminist movement of the 1960s led the way for women to increase their presence in almost all occupations in the Western world. Over the subsequent decades, U.S. women had higher labor participation rates than most other developed countries. We wonder: Seven decades since the end of World War II, is that statement still true? A. Yes, the United States still leads. B. Not quite, but it is still near the top. C. No, it is in the middle of the pack. D. No, it is near the bottom. A. Yes, the United States still leads … is not correct. During World War II, the percentage of women in the United States who worked outside the home increased from about 25% to 36%. For the first time, many women were working in industrial jobs, taking the place of men who had been called into the U.S. military. By 1970, the U.S. female labor participation rate — the percentage of women between the ages of 25 and 54 who were either employed or actively looking for work — had risen above 50% for the first time, according to OECD data. Three decades later, in 1999, the labor participation rate of women peaked at 77%. Remarkably, in 12 of the next 14 years this number would fall — falling to just under 74% by mid-2014. Most European nations have experienced the opposite trend. They have seen incremental annual increases in the labor participation rates of women. As of mid-2014, six OECD nations — all in Europe — had female labor participation rates of at least 85%. They are Slovenia, Sweden, Portugal, Iceland, Austria and Switzerland. A key reason for this development is that European nations are far more likely to offer extended paid maternity leave (as well as protections for women to return to their jobs after having children), government subsidized day care and other policies designed to keep women in the workforce. B. Not quite, but it is still near the top … is not correct. Of the 34 OECD economies, the 14 countries with the highest female labor participation rates in mid-2014 were all in Europe. In all of these economies — including Europe’s largest, Germany — at least 80% of women were actively involved in the labor force. Outside of Europe, 15th-ranked Canada has the highest female labor participation rate. Back in 1990, Canada’s female labor participation rate, at 76%, was only slightly higher than the U.S. rate of 74%. But while the U.S. rate is again 74% (after peaking at 77% in 1999), Canada’s female labor participation rate is 82% — eight percentage points higher than in 1990. The generosity of labor policies (such as paid maternity leave) is only one explanation for the higher female labor participation rates in Europe and Canada. Another explanation is the higher rates of part-time work for women in these countries. At 82%, the Netherlands has a very high female labor participation rate. But 61% of the Dutch women who were working were employed part-time, according to OECD data for 2012. By comparison, only 18% of U.S. working women are employed part-time. C. No, it is in the middle of the pack … is correct. At 74%, the U.S. female labor force participation rate is five percentage points lower than the 28-country average for the European Union (79%). This means that Europe has roughly 35 million more women in their prime working age (25-54 years) in the workforce than the United States. The U.S. rate is, however, slightly higher than the overall rate for the 34-nation OECD (72%). By this measure, the United States is in the middle of the pack in terms of female labor force participation. A high rate of participation in the workforce — as well as a high rate of employment — is a key measure of the status of women in society. A key factor in this regard is high female educational attainment, which is over time will help close the pay gap women still experience around the world. D. No, it is near the bottom … is also correct. The U.S. labor force participation rate for women in mid-2014 was higher than only six of the 34 advanced economies of the OECD. Only Ireland, Chile, Italy, Korea, Mexico and Turkey ranked lower. By comparison, the United Kingdom — which is both culturally and economically very similar to the United States — has a female labor participation rate of 80% — six percentage points higher than the U.S. rate. The level of women’s participation in the workforce is, in part, a reflection of the cultural values attached to women. In Korea (where only 65% of women are in the labor force) and Japan (74%), the traditional role for women has been to stay at home — despite the very high levels of education attainment for women in these countries. Likewise, predominantly Catholic countries (such as Ireland, Mexico and Italy) have had historically lower rates of female participation in the workforce. At the other end of the scale, former Communist countries such as Slovenia, Estonia and the Czech Republic have had higher rates.